FRANCE 1670. Carlo Demirco's mastery of the extraordinary new art of creating ice creams has brought him wealth, women, and a position at the court of Louis XIV. Then Carlo is sent to London, along with Louise de Keroualle, an impoverished lady-in-waiting. The most powerful ministers of two countries have decided that Louise is to be Charles II's new mistress, and will stop at nothing to make sure she submits. But Carlo too is fascinated by the enigmatic Frenchwoman.With the king's every pleasure the subject of plots and betrayals, and Carlo's only weapons his exquisite ice creams, soon he must decide ...Where do his loyalties lie? The title and cover of this book alone would have caught my attention, but to read further in the blurb and find out that it is set in the Restoration court of Charles II made it a must read for me! Stir ice cream into the mix and it is even better! The events that are portrayed in the book come to us from two different perspectives. The first is of a young man who we meet in Italy where he is the young apprentice of an ice maker. He is being taught the art of the ice by his owner - the four flavours, the skills, the tips to creating the perfect textures for ices, cordials, for ice carving and more. But Carlo has lofty ambitions. He wants to do more than just stick to the rules that he is being taught. He wants to experiment with new flavours, new techniques, and most of all, he wants to be his own man, to call no man master. Offered a chance to escape from his life in Italy, Carlo finds himself in the court of Louis XIV, and it is there that he meets Louise de Keroualle, a lady in waiting to Minette, the sister of Charles II, and sister in law to Louis XIV. Carlo is very quickly besotted, but Louise is out of his reach. She may be impoverished but she is the daughter of one of the most noble families of Brittany, and whilst Carlo has made his own way to Court, he is still of ignoble birth. It is Louise who provides the other perspective in the narrative. Following the death of Minette, Louise is sent to the court of Charles II. It seems everyone but here is aware of what her objective is to be - to become mistress to Charles II and to influence his decisions and policy to the advantage of her native France. Carlo is also sent to France as part of the 'gift' from Louis with a brief to create an ice the likes of which has never before been seen or tasted in England. One of the hallmarks of the decadence of the Court is that there was a total fascination with all things French - fashion, art, food... ices. Carlo spends all his time trying to create the dessert that we now know as ice cream, using some of the most famous intellectuals of the time to help develop the methodology. Far from being an accessible treat as it is for us today, the desserts created by Carlo were only for the rich and powerful, and sometimes they were created for the king alone. Many of the desserts that are described in the book sound incredible - for example, at one of the feasts Carlo creates a pineapple ice that not only is made from the then exotic and difficult to obtain fruit, but is also carved to look exactly like a pineapple - although in the quest for more and more unique tastes and combinations there were also some that were not quite so enticing to my more modern palate! Providing contrast to the glittering courts, we also get introduced to Hannah and Elias who live in the same establishment as Carlo. These are the working class, the people who suffer under the heavy burden of poverty and who see the merriment of the court and find it hard to believe that there can be such wastage, particularly as the king and parliament are increasingly at odds about issues like funding the wars against the Dutch. Stir in anti-French sentiments and anti Catholic sentiments that were rife at the time and they provide a necessary contrast to the constant over the top details of life at Court. When you read an Anthony Capella book it becomes obvious pretty quickly that this is an author who loves food, and I would go so far as to say that if you want descriptions of sensory experiences - be they taste, sight or the other senses - then Capella should be a go to author. This is particularly true of The Wedding Officer and the Food of Love with their focus on Italian food, and of this book. It is only when the narrative moves away from the focus on the sensuous that it loses its way. Unlike some of the other portrayals I have seen of the relationship between Louise and Charles this one is definitely more clinical, colder and more about business, and this is also a bit of a difference between this book and others by this author that do tend to have romantic themes. I have heard love compared with a fire. But that is all wrong. If you touch a flame you draw back. The pain is quick and sudden and then it is gone. Love is like ice. It creeps up on your, entering your body by stealth, crumbling your defences, finding the innermost recesses of your flesh. It is not like heat or pain or burning so much as an inner numbness, as if your heart itself were hardening, turning you to stone. Love grips you, squeezing you with a force that can crack rocks or split the hulls of boats. Love can life paving slabs, crumble marble, wither foliage from trees. I find it difficult to to go past Boysenberry. I first tasted this flavour when I went to Christchurch in New Zealand many years ago, and will always therefore associate it with New Zealand, but I am grateful that the flavour is also accessible here! First, wow -- sounds like a book I'd liked . . . a lot. I don't think I've read anything by Capella, and I should correct that omission. Favorite ice cream. Shoot. I guess I have to say my go-to flavor is coffee. But we have a local dairy that makes the best lemon custard ice cream, oh and a coconut one I love too. Boysenberry sounds pretty yummy too. Lemon custard ice cream sounds good! I have really liked Anthony Capella's books, with the exception of Various Flavours of Coffee. Two of my favorite things in one book: historical fiction and ice cream! If I had to pick a favorite, I would say now, vanilla fudge ice cream. Over the years, my "favorite" has run the gamut from pistachio to caramel to a brief flirtation with banana. Wow, I've seen this book (the title is hard to forget) and had no idea what it was about! I wonder if you've ever read Rose Tremain's Restoration if you like Charles II novels? I had green tea ice cream for the first time recently, and it is an absolute new favourite. I don't think I would ever turn it down. I haven't read any by this author but I do enjoy this type of reading so I'll add it to the list, especially if he brings food to his story. I've always loved the name of that book, but haven't picked it up. My favourite ice cream flavours are numerous, but kiwi reminds me of New Zealand and I can't say no to peanut butter! I live a 5 minute walk from one of the best ice-cream shops in The Netherlands :) Lucky me! My fav flavours were limoncello and 'Wittevrouwen' (white ladies) with yoghurt, honey and sesame. Alas, since I turned vegan earlier this year I can't have those anymore! BUT. Their blood orange sorbet is awesome as well! Very compelling story. I especially like the quote you used comparing love to ice. I'm going to be thinking about that for some time. 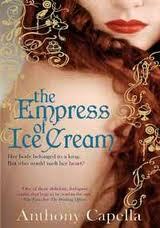 Oh, this does sound like a wonderful book, and how could I not love a book that features royals and ice-cream? I just came across the most decadent ice-cream flavor the other day. It's called Late Night Treat, and it's by Ben and Jerry. It's vanilla bean ice-cream with a caramel swirl, and has little pieces of fudge covered potato chips stuck inside. I know it sounds weird, but the mixture of sweet and salty really hit the spot. I ate the container in one sitting, which was not really all that good for me, but I couldn't help it! Sounds like an interesting book, and with ice cream, too! I have heard lots of really good things about this book but never looked into it to deeply. But historical fiction and ice cream? not sure how you can top that. What an interesting sounding book--chock full of history! Sounds like an interesting book. My favorite ice cream? Pralines and cream. This looks a good book, I have read a previous book by Capella. My favourite flavour of ice cream is coffee-Mmmm! Sounds like a fun story. I like any ice cream that has chocolate in it and am currently drooling over Rikki's Mozart description. This sounds like a mixture of food, literature and history...I'm in! Don't shoot me but I'm not a big ice cream fan...Baskin Robbins Chocolate Chip is the only ice cream that I really go gaga over. Peppermint PH.D - I don't experiment a lot with flavours so Chocolate Chip sounds good to me. Joy and Rikki - Mozart flavour does sound interesting! Anglers Rest - which one did you read? I must admit I haven't tried coffee flavoured ice cream. Diann - mmm Praline. I like it a lot but can't have it too often because of a hazelnut allergy in our house. Margot, I have seen love compared to many things but not ice before which is why it struck me so much. Gnoe, blood orange sorbet sounds like a perfect summer treat! Caspette, it's definitely a fun combination. Sam, not sure I have ever had kiwi icecream or peanut butter - not a huge fan of nuts though. Carol, I can't tell you the last time I had a soft serve ice cream. Kate I haven't read Restoration. I tried reading one Rose Tremain novel but it didn't really work for me. The Bookgirl, I hope you like his book if you do give it a go! Ok, I really have to read this book. What I'm really craving right now is cake batter flavored ice cream like that available from Coldstone (though Ben and Jerry and Perry's also have similar flavors). I read Food of Love - from memory it was a good read. What I forgot to say in my last comment - distracted as the doorbell rang! There is a super ice cream shop in town; popular with tourists, they serve the most delicious coffee ice cream in a cornet. 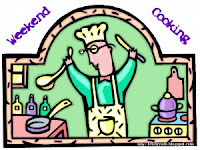 Mm, yum! Sunday Salon: Reading the immigrant experience. 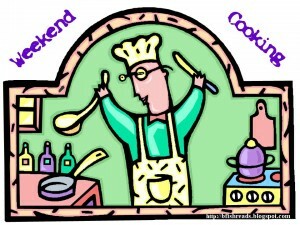 Weekend Cooking: Who taught you to cook?